As of Sunday, Beijing has enjoyed 274 days of "blue sky" in 2011, fulfilling its annual target ahead of schedule, an official with Beijing's Municipal Environmental Protection Bureau said Sunday. Beijing has seen an overall decline in the concentration of various pollutants in 2011, said Zhuang Zhidong, deputy director of the bureau. The PM10, or particular matter under 10 micrometers, decreased to 114 microgrammes per cubic meter this year, the lowest in four years, according to the bureau. The overall air quality of Beijing was better than last year, with 22 more days of grade I air quality than were recorded in 2010, Zhuang said. Beijing uses a five-grade classification of air quality on the basis of pollution indices, with grade I being the best and grade V the worst. Days with grade I or II air quality are considered "blue sky days." 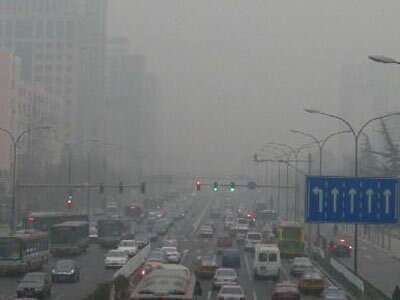 However, Beijing also experienced several days of poor air quality as a result of bad weather conditions. Factors such as weaker winds and a rise in humidity are unsuitable for the dispersal of atmospheric pollutants, according to the bureau. The bureau has been keeping a close watch on construction sites and coal-fired boilers in order to reduce emissions of pollutants since the city began supplying heat in mid-November. Air quality monitoring in Beijing made headlines recently due to public debate over different standards of measurements. China currently uses PM10, or particular matter under 10 micrometers, to measure air quality, but the public has urged government authorities to apply the tighter PM2.5 standard, which measures finer matter that is considered more hazardous to people's health as it can go deeper into the lungs. The Ministry of Environmental Protection said it has been considering revising present standards, and a new index standard which includes the measuring of PM2.5 and ozone density is scheduled to be fully implemented nationwide in 2016 with pilot projects conducted in certain regions ahead of the national deadline. Zhuang said the Beijing Environment Monitoring Center has started making preparations for the monitoring of PM2.5, including purchasing relevant monitoring equipments, setting up monitoring posts and training staff. A "blue sky days" target has been set to encourage the city to improve its environment. Authorities are aiming for 274 "blue sky days" this year.